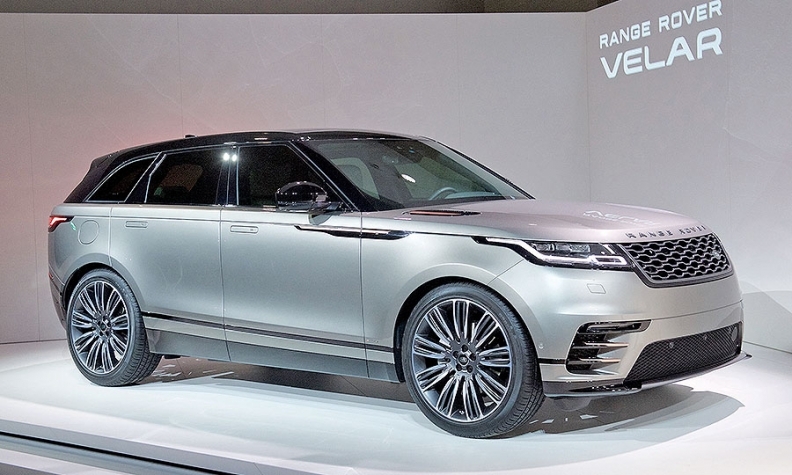 New models such as the Range Rover Velar have helped boost JLR sales. LONDON -- Jaguar Land Rover said sales rose 7 percent to a record 621,109 vehicles in 2017 but the automaker warned it faces tough conditions in its UK home market due to weakening consumer confidence and a planned diesel tax hike on new cars. December registrations rose 1 percent to 55,697. Jaguar sales rose 20 percent to 178,601 over the year and were up 8 percent in December to 15,079. Land Rover volume increased 2 percent to 442,508 in 2017, and rose 4 percent to 40,618 last month. Since being bought by India's Tata group from Ford Motor in 2008, Jaguar Land Rover has pursued a major turnaround plan to refresh and expand its model lineup and to increase volumes to around 1 million by the turn of the decade. It said growth in China, its largest market, and in the U.S. helped to offset difficult conditions in the UK and the rest of Europe. "We have once again delivered year-on-year sales increases thanks to a world-class product range and new models such as the E-Pace and Velar, as well as China-specific models such as the XFL," group sales operations director Andy Goss said in a statement on Monday. "But we are facing tough times in key markets such as the UK where consumer confidence and diesel taxes will hit us," Goss said. However, JLR does expect domestic sales to rise this year from 2017's 118,000 vehicles. Britain's car industry body said last week that 2017 sales across the sector recorded their biggest drop since 2009, blaming plans to increase a levy on new diesel cars from April and weakening consumer confidence in the wake of Brexit. Like the rest of the UK car industry, Jaguar Land Rover faces uncertainty over possible tariffs or customs delays if Britain fails to secure a favorable Brexit deal before the country leaves the European Union in March 2019. Britain's finance minister Philip Hammond said in November that the vehicle excise duty would rise from April for those buying almost any new diesel car, potentially costing hundreds of pounds more for top-end models. Around 90 percent of JLR sales in Britain are diesel models, which compares with around 45 percent globally. Separately, Goss said JLR will have to decide in the next 12 months whether to build electric cars in its home market. The company's first EV, the I-Pace, will be produced in Austria by contractor Magna Steyr.